Kal Yafai could well face boxing superstar Roman Gonzalez next, says promoter Eddie Hearn. 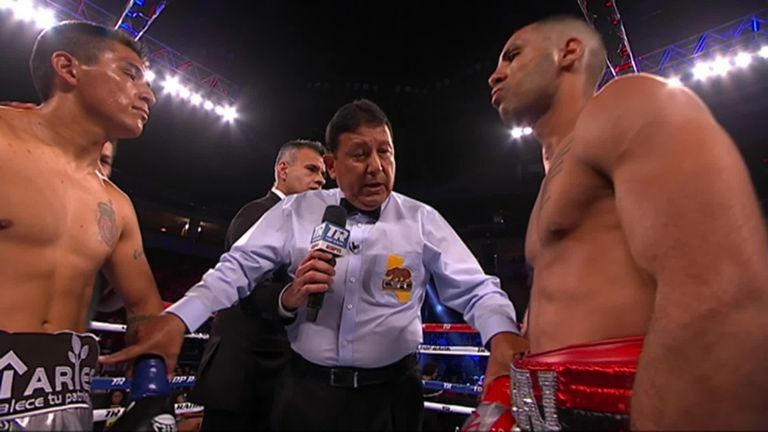 The WBA world super-flyweight champion defended his title in style against David Carmona on his American debut, in California, on Saturday night. Kal is ready for the challenge of unification but we also really like the Chocolatito fight and have already opened talks with his team. IBF counterpart Sherwin Ancajas was on the same bill but although Hearn has not ruled out a unification showdown, he is already in talks for Yafai to take on four-weight world champion Gonzalez. "Kal made a big statement over here and I can see him staying in the States for his next fight," he exclusively told Sky Sports. "He is ready for the challenge of unification but we also really like the Chocolatito fight and have already opened talks with his team. "There's exciting times ahead Kal, for sure." Kal Yafai floored David Cardoma multiple times on his way to an impressive win, his first on American soil as a professional. Gonzalez is looking to return to the ring following shock back-to-back losses at the hands of WBC champion Srisaket Sor Rungvisai, the last one a fourth-round KO in September. 'Chocolatito' has won world titles at minimumweight, light-flyweight, flyweight and super-flyweight and went 46 fights unbeaten. Yafai has been calling out Gonzalez for more than a year and is already looking forward to making another impression on America. "What a way to start with my American debut, putting on a show like that," he said after the fight. "I really enjoyed it, the first time in the United States and I can't wait to come back. "I'll fight anyone. I'll sit down with my team, sit down with promoter Eddie Hearn and we'll see what's out there and earn with Hearn, baby!"